John was elected to Parliament for Marlborough in April 1660 by one vote, in Oct 1666 he was admitted to Gray's Inn and became a Bencher. A gambler he was largely dependant on his mother for money, he was burdened by debts which strained relations with his wife Sarah. 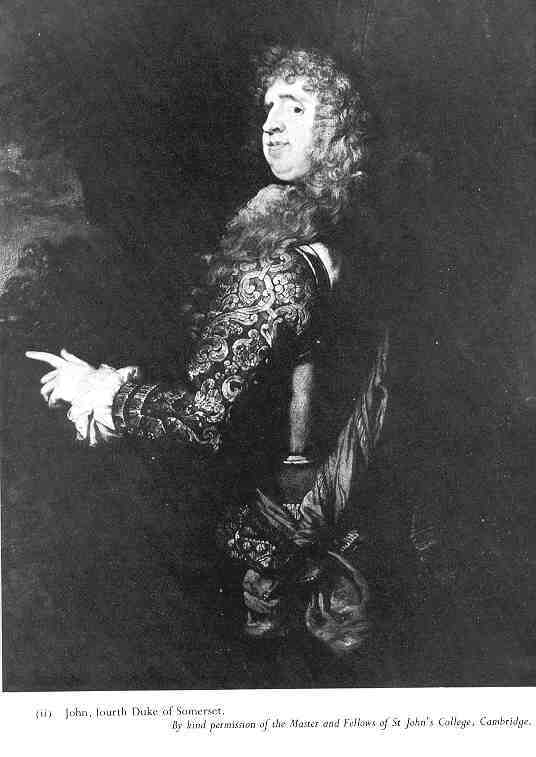 John came to his family title by the premature and unexpected death in 1671 of his young nephew William the 3rd Duke, however his financial affairs continued to deteriorate and within a year of his assuming the title the couple parted. Sarah petitioned the King to resolve the mostly financial matters between them. The publisher can supply copies of the edition and also single reels, offprints and CDRom. [from Scope and Content] Instructions by John Seymour, Duke of Somerset, as to the term of separation from his wife [Sarah, dau. of Sir Edw. Alston]; 12 Feb 1672-1673; with letters from him to his brother-in-law the Earl of Winchilsea on the same subject, 12 Mar., 15 Apr., 1673. ff. 161, 163, 165. [from Scope and Content] Lease for a year by Frances [Seymour], Duchess of Somerset, and others Sir Harbottle Grimston, Bart, Sir Orlando Bridgeman, Bart., Sir Edward Alston, of London, knt., and Penning Alston, of London, esq., of the manors of Pembridge and Earsland, Lyonhall and Murcott, Webley, Byford, Bodingham, Fanhope, Rosse and Rosse Forraigne, co. Hereford, and a moiety of the manors of Ferney al. Hifferne, Downe Mayne and Clankervill, co. Monaghan, in Ulster. Dat. 28 Jan., 1661-1662. Counterpart. Endorsed "Lease. . . . . upon Lord John Seymours marriage". This catalogue is a summary of the documents held at Longleat rather than a full description. The Finding Aid (Index) contains entries for the whole collection and therefore will give references for entries that may not appear in Giles on-screen. Belonging to the Collection, though not a MS., is a small printed French Bible in the Old Library, "La Sainte Bible en Francois", published "a Lyon, par Sebastien Honore, 1558". The book belonged to Edward Seymour, Earl of Hertford, son of the Protector (see above), and was evidently used by him in the Tower, where he was confined from 1562 to 1571, together with Lady Katharine Grey his wife (who died 27 Jan, 1567-1568), on account of their clandestine marriage. It bears his signature "E. Hertford" and motto". Foy pour devoir" on the title-page, and at the end, in his hand, are entries of the births of his sons Edward, 24 Sept. 1561, and Thomas, 11 Feb, 1563-1564, followed by a prayer for them in French. A description with transcript of the MS. entries by Canon J. E. Jackson is inserted in the volume, and a full account of it is given by him in the "Wilts Archaol. Mag." XV. pp. 154,192. Another volume which probably formed part of the Seymour Collection (cf. vol.i) is among the bound MSS. in the Old Library, No. 60. It contains: (a) A census "of alle Inglisshemen, women and children, denezins and straungers" within the town of Calais, taken 15 Mar, 30 Hen. Viii , together with all victuals, corn, grain and fuel.f.1;- (b) "The devices for the fortificacion of the town and castle of Calis", as well as of "Ruisebanck, Newnambrige, Guisnes and Hampnes", Mar. 1539.f.70. Lady Arabella Stuart's Letter will be found in the 2 vols of "August Letters" (12 Talbot Papers) in the Old Library Ins 112. They are bound in red morocco 4 are generally kept on show in the big desk. [from Scope and Content] Copy of settlement, relating to the recent marriage between Lord John Seymour, only surviving son of late Duke, and Sarah daughter and heir of Sir Edward Alston.